Here is my first ever bump picture. This is actually smaller than in reality. I am actually pretty big. Waaaaay bigger than the other 3. Someone said yesterday ‘wow are you having twins’ cos she thought I was very big for 10 weeks. Oh dear! I was 7 months pregnant when I stayed to show with G, my first pregnancy I guess I’ll just have to get used to being big this time. Or maybe it is twins………………..? 9 weeks 5 days pregnant. I’m living off crisps, crackers and soup at the moment; the sickness gets progressively worse throughout the day. Ironically I feel the best in the morning. I’ve been waking up very early for no reason, just bolt upright wide awake at 5:30am. I’m assuming thats to do with hormones. When I was pregnant with H (second pregnancy) it was awful, for the first 5 months I slept an average of 2 hours a night. I would have no problems getting to sleep usually about 9pm and then 2 hours later I would wake up, wide awake with a hot flush. Literally boiling hot drenched in sweat. I would not be able to go back to sleep then at all for the rest of the night. Nothing I tried (beside drugs) helped until one day after 5 months I slept through the whole night. It was the worst sleep deprivation ever, complete torture. That was just one of the many problems I had in that pregnancy (by far the worst out of the 3 ) which ended in a retained placenta causing me to haemorrhage 2 litres of blood needing 3 blood transfusions! However, this is the result of that difficult pregnancy: She was worth every second 🙂 forgive the crazy oversized bow i do tend to go a bit wild in the bow department with her. Hello morning sickness! I’ve Been suddenly hit by a freight train and a bus and a truck all at once and I feel AWFUL! Wow it just came out of the blue as I was just thinking: this is great, no morning sickness yet and I’m really enjoying my food. Bham! Feel so out of it and forgetting everything, doing really silly things. A, was up in the night last night for 3 hours and I really thought I was going to loose it. She woke up after I had just gone to sleep needless to say I was incrediably moody today and just about held it together. I also had my first midwife appointment today as well. I’m in a new area since having my last and so a new doctors surgery and midwife. She was lovely and arranged my booking in appointment for next week which she said takes roughly an hour! Exciting! I have to say midwife appointments are the highlights of being pregnant. I usually make them when I know Paul is around so I can go on my own which is a luxury in itself and it just feels like each appointment is a spa day. It does feel like I’m being pampered each time, although I don’t know why? Another symptom is tummy is showing a bump already although I don’t know how as the baby is only the size of a raspberry. Somebody even commented that in showing already today so it’s not just me. I think in this blog I’m going to take bump pictures, something I’ve never done before. I think I’ve only got a couple of pictures from all three pregnancies in total. Ok, feeling a wave of nausea now going to go. Hello mood swings!!!! Oh dear, its been pretty intense this week with my main swing being ‘angry,’ especially at Paul. He says I’ve been really mean. I’m sorry, I’m trying really hard (not really) to not be angry. Anyway I did two very annoying things this week which I completely blame pregnancy for. First I fell whilst holding the computer in the kitchen and the screen smashed which is costing £500!!!! to fix and then a day later I backed into a lamppost (only a little damage patch done). Apart from that the morning sickness hasn’t really properly hit yet although I did feel sick in week 4. In the other pregnancies I started all-day sickness in week 8/9 so just waiting for that and enjoying food while I can. I had the weirdest craving yesterday though; I was shopping and went past the Chinese food section and saw this seaweed and HAD to have it. I’ve never eaten seaweed before! Anyway I ate it and nearly a whole cooked chicken and it was yummy. I am also managing (pretty much failing) whilst Paul is away for 6 days. This is day 3 and I survived the school run and a hellish breakfast. I decided (very foolishly) to make banana pancakes which no one ate and I threw in the bin which got me really angry and then I said ‘I don’t care’ (which always means I do) and made toast which only H ate and G refused which meant him going to school without breakfast and saying I’m hungry all the way to school. Still incredibly excited except now trying really hard not to get anxious with being in the first trimester and the waiting for that all important first scan. I probably shouldn’t have googled ‘chances of miscarriage’ as now I have all the statistics running through my head. I found out that its not just your age that affects how healthy your eggs are but also the paternal age really affects the sperm health. Over 40 is supposed to increase the risk massively with genetic mutations 😦 and Paul is 51! Anyway I just want to be happy and not fearful. I’ve now told way too many people which I regret a bit. Oh dear, making so many unwise decisions at the moment, must be my pregnancy brain. 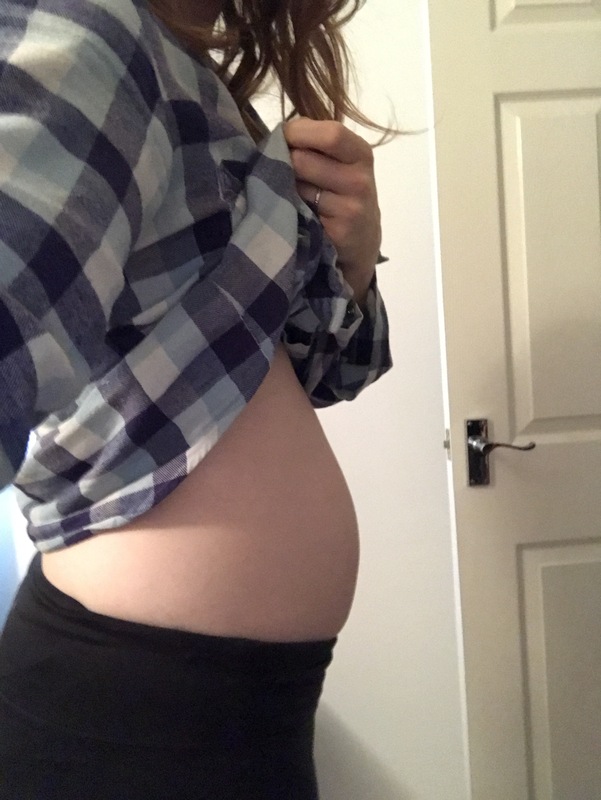 Symptoms this week are: more energy than last week (enjoying this while is lasts), skin breaking out, craving really unhealthy foods which has happened to me in all three pregnancies. When I’m not pregnant I eat quite healthily and try to do regular vegetable juicing, low to no sugar etc but when I’m pregnant that all goes out the window and juicing is replaced by junk food and no sugar is replaced by lots of chocolate! I generally feel sick the whole 9 months, peaking in the end of the first trimester and then the last 2 months. I throw up more in the last trimester than the first which is weird and i’ve never met anyone who has that. G-J (4 years old) says that the baby in my tummy is a boy and he is called Aiden. H (3 years old) ran into my piano lesson on Saturday and said: ‘baby in Mummy’s tummy.’ Thanks to her very unclear pronunciation the parents did not get it. I definitely don’t want my pupils to find out yet before I know exactly what I am doing with maternity leave. A (19 months) doesn’t understand whats going on but is very clingy. I read that the youngest child just intuitively gets it and becomes a bit more clingy to the mother. May not be true but definitely happening. Either that or teething. 4 weeks pregnant with number 4! I Found out I was pregnant last week at only 8dpo!!! It wasn’t a shock as we were trying (just) Ironically this is the only baby out of the 4 that was planned. We have had 3 babies in 3 years that all came out on their merry way and changed our lives without asking. I was very excited, Paul was happy but a little worried and stressed about it. Apart from exhaustion and a yucky virus, looking like a ghost, broken out skin and a very bloated tummy and mood swings I don’t have any pregnancy symptoms yet. They have come extra early this time… or maybe I have just noticed it more or maybe its TWINS?????? This is the question which is going through my mind 24/7 at the moment and I am trying really hard not to get obsessed with googling early signs of twins. 8 weeks seems like a loooooong time to wait for that scan. Lord, give me patience.